I’m one of those delicate flowers who can’t drink coffee. I mean, for real, I can’t tolerate it. The caffeine makes me feel like I’m dying, having an anxiety attack, and the world is coming to an end all at the same time. I used to be a coffee drinker, and I can’t remember what made me stop (it’s been almost 20 years) but I do remember it being a revelation when I finally realized that coffee made me feel like crap. So, I’m a tea lady. I start most days with two XL mugs of hot, super milky black tea, and then after 10am or so I switch over to caffeine-free varietals since black tea after 10am will mess up my sleep like you wouldn’t believe. Like I said, I’m a delicate flower. I’ve been working on a recipe for the perfect Pumpkin Chai Latte for some time now, and I’m pleased to say I’ve finally nailed it. 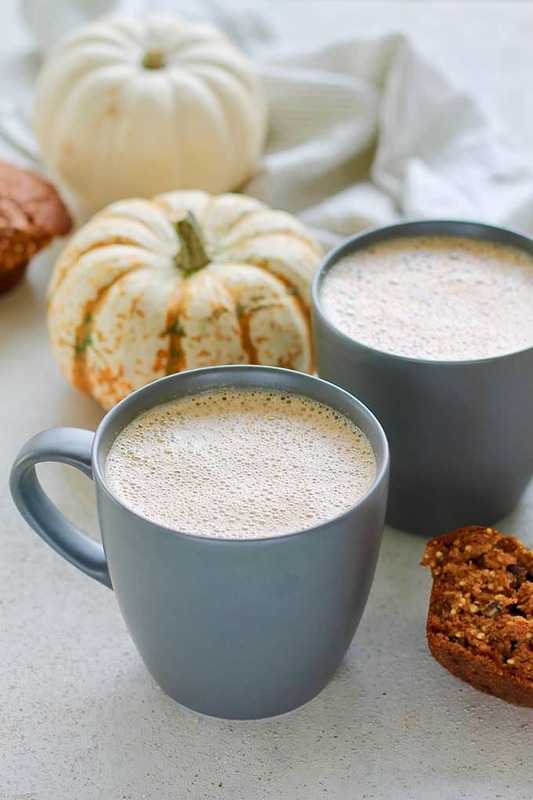 No need to waste your money on over-priced and overly sugary coffee shop pumpkin lattes when you can make one this good at home! I must say, I take a certain pleasure in scrooging my local coffee shops out of my hard earned dollars, and surely I’m not alone in this. What do I need to make a pumpkin chai latte? Pumpkin purée! We’re going with the real deal here. Either canned or homemade is fine. Chai tea. Choose your favourite loose leaf or bagged chai tea. Black or rooibos both work great. Spices! We’re whipping up a quick homemade pumpkin spice blend here. Milk of your choice. I’m using dairy-free oat milk here, but almond work and cow’s milk also work just fine. Maple syrup. 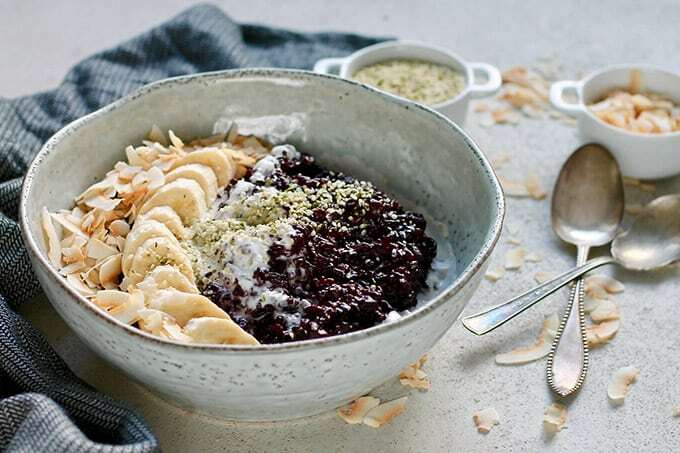 Just a touch of the good stuff for a little bit of natural sweetness. MCT oil. This is optional, but whips up one heck of a frothy latte if you include it. 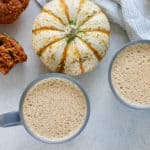 How do I make a homemade pumpkin chai latte? We’re going to boil up a little bit of water and let our chai tea steep in there for a few minutes. Then we’ll add the milk and bring to a boil so the whole thing is nice and hot. 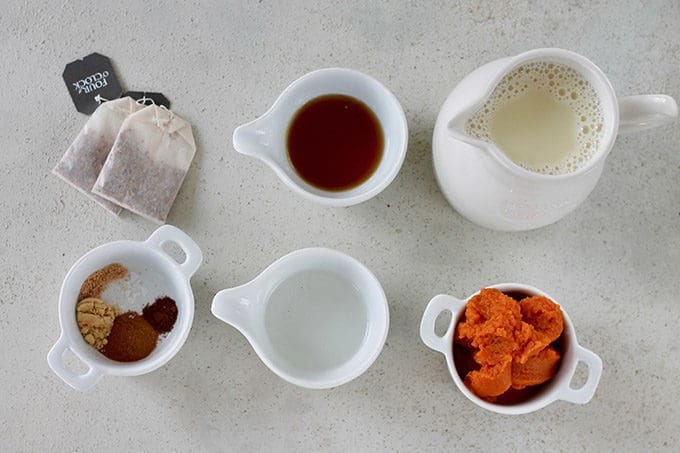 We’re going to fish out the tea bags (or strain if you’re using loose tea) and then add the pumpkin purée, maple syrup, MCT oil (if using) and spices. Now we’re going to blend it all up. I recommend using an immersion blender right in the pot if you have one. You can also pour the mixture into a stand-up blender, but BE REALLY CAREFUL when blending hot liquids. They’re super volatile and can expand and blow a hot mess all over you and your kitchen. 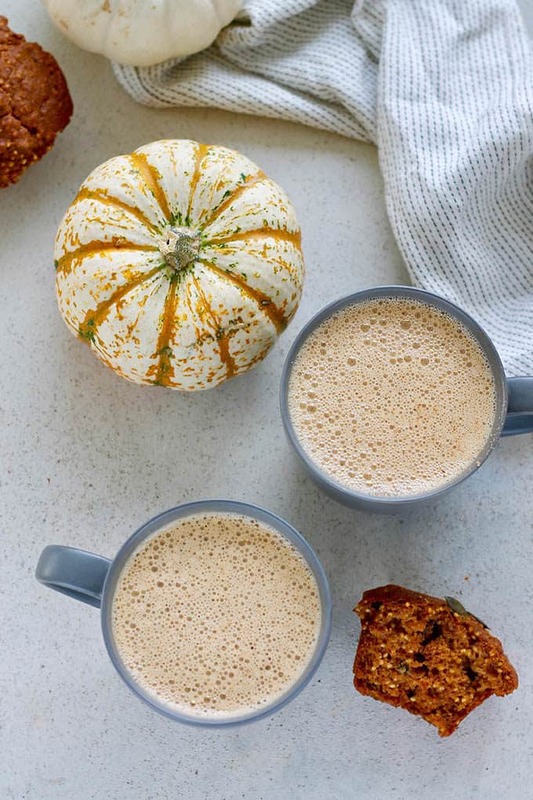 Blend the pumpkin chai latte for 30-60 seconds to combine everything well, pour into mugs, and sit back and sip on that fall coziness. Hey Nutrition Lady, what’s the deal with MCT oil anyways? So, when I hear about a nutrition or wellness trend I tend to approach it with some scepticism. 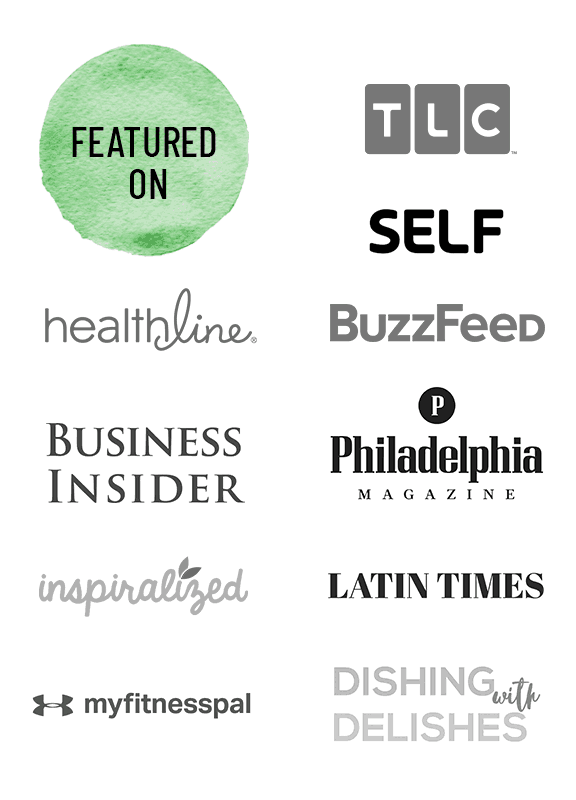 I don’t like snake oil, or anything touted as a miracle cure-all superfood wellness solution. But, I also have a policy of trying out most things (within reason) so that when people ask me about it I can give the most educated answer possible. In that spirit, about a year ago I went out and bought a little bottle of MCT oil. MCT stands for medium-chain triglyceride, which is a type of fatty acid that’s been getting a good amount of attention because it’s a type of fat that actually helps us burn fat. The majority of the fat in our diets come from long-chain fatty acids, which must be first modified by our digestive systems and then absorbed by our bodies. MCTs on the other hand are rapidly broken down and absorbed, so they’re readily used for energy by our bodies. In clinical settings MCTs have been used for people who need to increase calories without adding a lot of volume, ketogenic diets (in the treatment of epilepsy), and those with malabsorption issues. 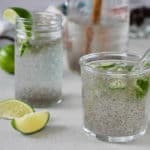 Studies have shown that people who start their day with 1-2 tablespoons of MCT oil (typically in a hot beverage or a smoothie) tend to feel full for longer and eat less at subsequent meals. Furthermore, since MCT oil is a source of instant energy, it makes it unnecessary for the body to store fat as an energy source. Make no mistake, I’m not here to promote fat-burning diets in any way. But I will say that I was pleasantly surprised when I tried adding MCT oil to my tea lattes at a) the creamy and satisfying taste and texture, and b) the sense of satiety they provided. 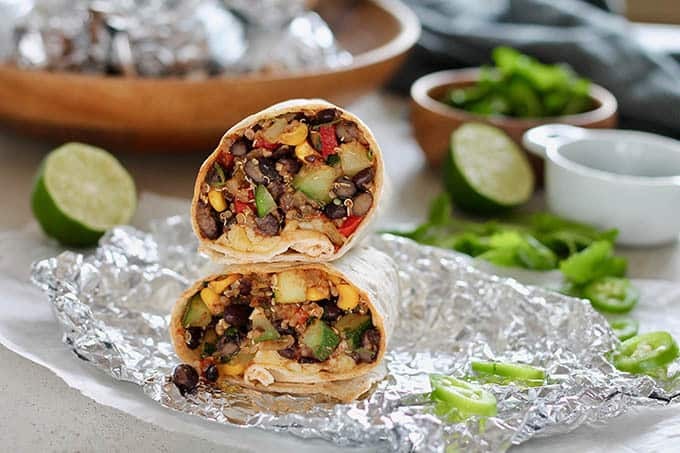 You can take it or leave it in this recipe, it’s totally up to you! I like it in there for the overall drinking experience. Does it matter if I use black tea or rooibos in this recipe? Nope! Dealer’s choice. What kind of milk works best? 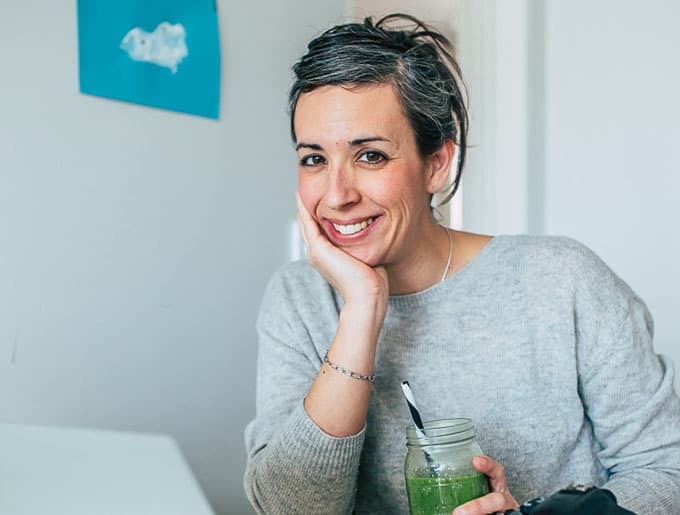 My favourite plant-based milk (and what I use for most tea lattes) is oat milk, but you can use almond milk, cow’s milk, or another plant-based milk of your choosing! 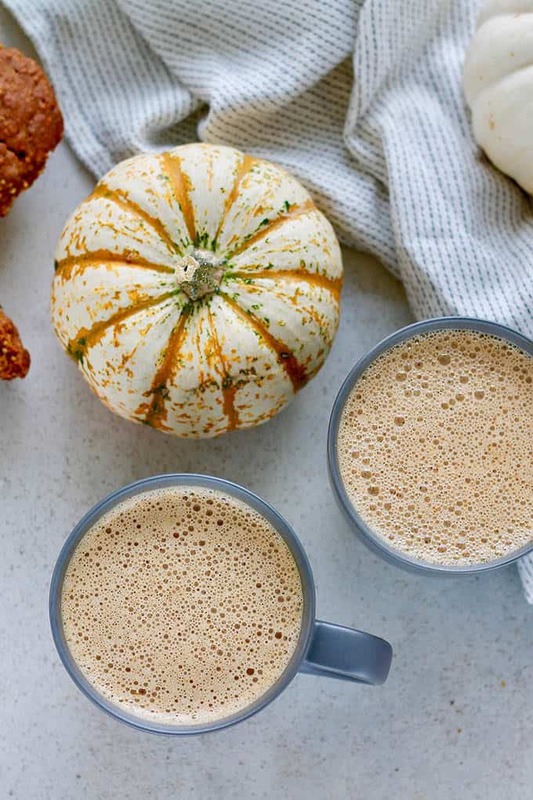 Is this pumpkin chai latte paleo? If you use almond milk then it’s totes paleo. 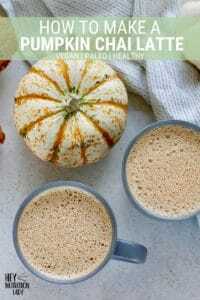 Is this pumpkin chai latte keto? You’d have to leave out the maple syrup and use almond milk in order for it to be keto. 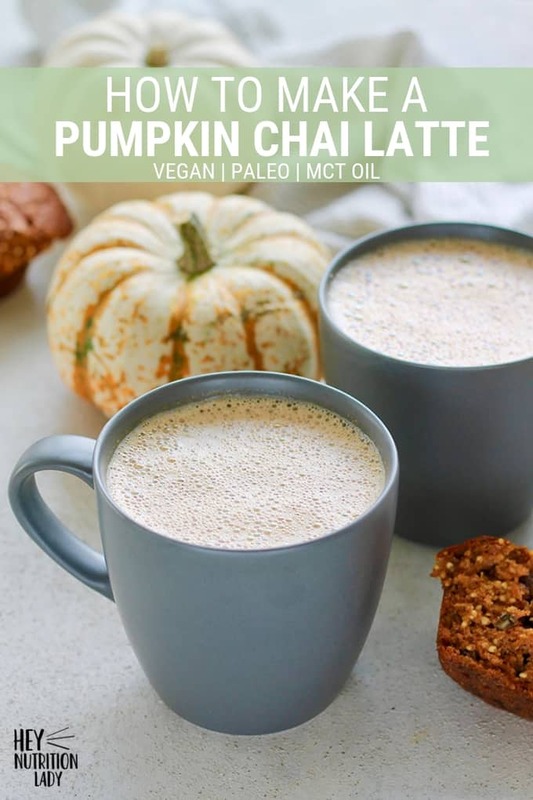 Is this pumpkin chai latte Whole 30 compliant? If you leave out the maple syrup and use compliant almond milk, then yep. 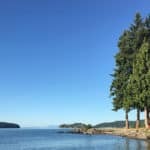 Do I have to use the MCT oil? Nope! I love how foamy and satisfying it is with the MCT oil in there, but if you don’t have it or don’t want to use it, feel free to leave it out. 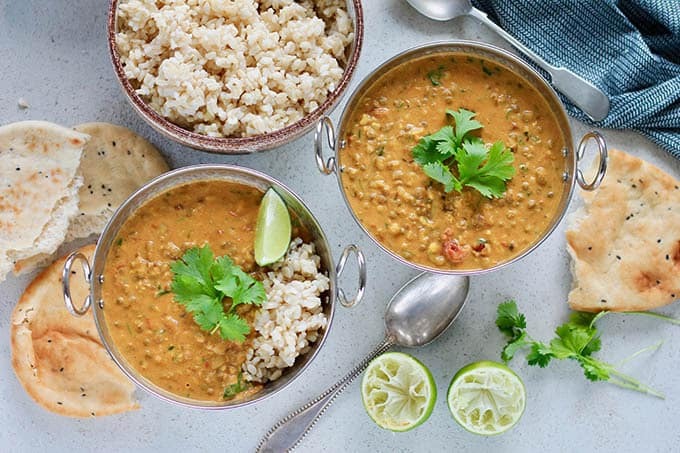 Is this recipe vegan? As written it’s totally vegan. Can I make this without a blender? If you don’t have a blender of sorts I’d leave out the MCT oil and whisk the hell out of it by hand. Bring the water to a boil in a medium sauce pan. 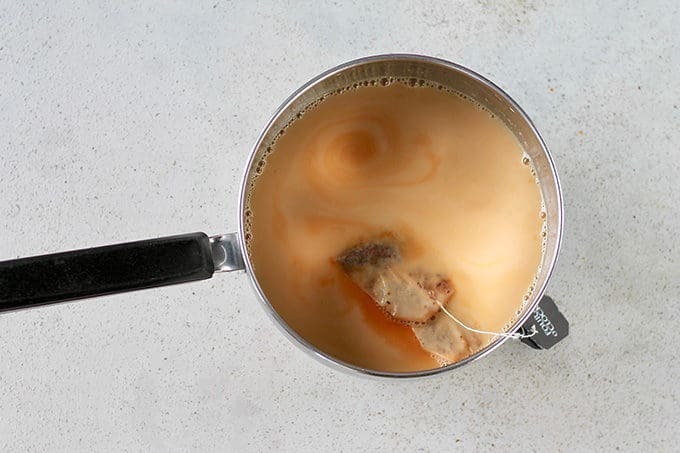 Add the chai tea bags, and let steep for 5 minutes. Add the milk to the pot, and bring to a boil. Remove from the heat and add the pumpkin purée, maple syrup, MCT oil, and spices. 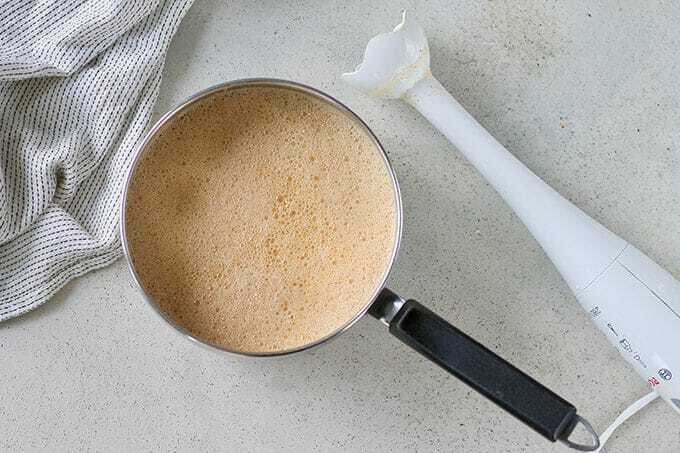 Using an immersion blender, blend the latte until the ingredients are well combined and the milk is frothy - about 30 - 60 seconds. 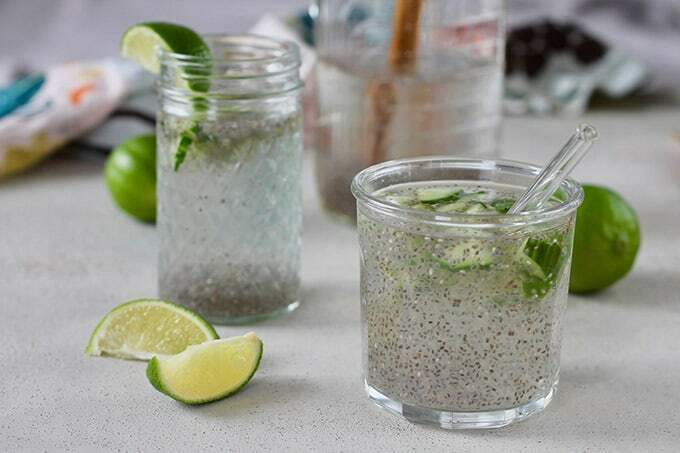 Pour into mugs and serve immediately. 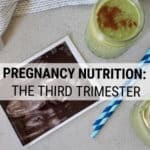 Nutrition has been calculated using unsweetened oat milk, maple syrup, and MCT oil. 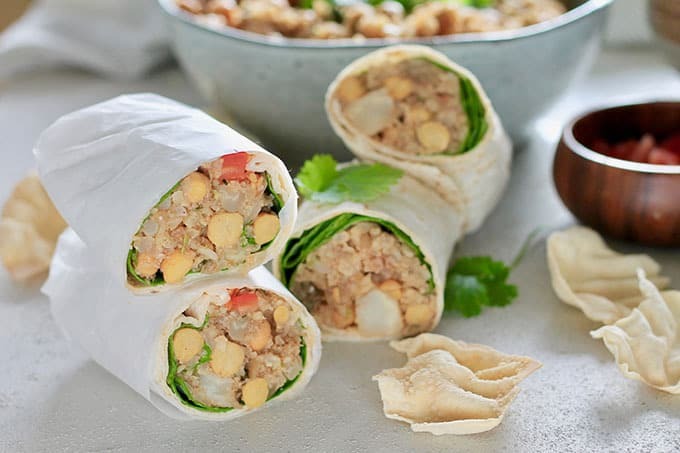 Modifying the recipe will change the nutrition output. Does it matter if I use black tea or rooibos in this recipe? Nope! Dealer's choice. What kind of milk works best? 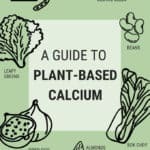 My favourite plant-based milk (and what I use for most tea lattes) is oat milk, but you can use almond milk, cow's milk, or another plant-based milk of your choosing! Do I have to use the MCT oil? Nope! I love how foamy and satisfying it is with the MCT oil in there, but if you don't have it or don't want to use it, feel free to leave it out. Can I make this without a blender? If you don't have a blender of sorts I'd leave out the MCT oil and whisk the hell out of it by hand. Thank you Katie. You’ve upped my mid-morning coffee game. I’ve been making these most days at my 10am hump and it feels like such a treat. No more $6 food-like-substance lattes for me! I’ve been adding the pumpkin when I add the milk so that it cooks, which I like better. I’ve also started prepping several servings of the pumpkin and spices and storing them in the fridge so that I don’t have to get all the spices out and measure them each time. I’ve been thinking that I need to work out the ratios and make a spice mix like you have for the Turmeric Lattes. Brilliant idea, Kimberly. It’s making me wonder if you could do a batch that used a full can of pumpkin purée and then frozen in individual portions, like in an ice cube tray or something? I’ll have to test it out! Just happens I have pumpkin in the fridge, a brand new immersion blender and I already drink a daily chai. So this is going to happen. Very interested in the MTC oil. I will be looking that up. Next level coziness in a mug! Where can I look to buy MCT oil? Looking forward to trying this! 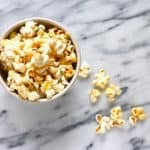 There’s a link to a brand of MCT oil that I like in the recipe notes! That recipes sounds yummy, but I”m drooling over the millet (?) muffins in the photo. Where can I find that recipe? thanks!